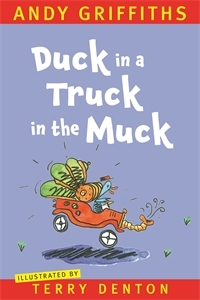 Chuck the Duck's ice-cream truck is stuck in the muck! Can his friend Buck and his muck-sucking truck save the day? A rhyming story of friendship and fun that will delight Andy fans, especially beginner readers, accompanied by Terry Denton's energetically comic illustrations. This story first appeared in The Cat on the Mat is Flat, a collection of short stories. The original black and white illustrations are now in colour, and the story has been redesigned in a larger format.